Violinist Jiafeng Chen was hailed in the English press who is “not only technically brilliant but also subtle, deeply felt and astonishingly mature” (Nottingham Evening Post). He has been heard as a soloist with the Finnish Radio Symphony Orchestra, Hallé Orchestra, Helsinki Philharmonic Orchestra, Opera National de Nancy, Orchestre Royal de Chambre de Wallonie, Philharmonia Orchestra (UK) amongst others. He has collaborated with violinists David Chan and Cho-Liang Lin; cellist Gary Hoffman; and conductors Paavo Berglund, Paul Goodwin, Lorin Maazel, Paolo Olmi, Petri Sakari, John Storgårds and Gilbert Varga. He has performed at BBC Proms in UK, Verbier Festival in Switzerland, Valdres Sommersymfoni in Norway and La Jolla Music Society SummerFest in USA. 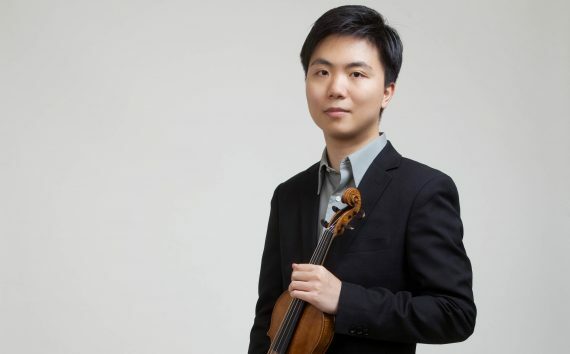 Jiafeng Chen is a top prize winner of several major violin competitions including the International Competition for Young Violinists K. Lipinski and H. Wieniawski in Lublin, The Sibelius International Violin Competition in Helsinki, the Yehudi Menuhin International Competition in Cardiff and the Windsor International String Competition in Windsor. Chen is also a Laureate of the Queen Elisabeth International Violin Competition. Further more, he was awarded the Paganini Prize at the Indianapolis International Violin Competition, and the Silver Medal from the centuries-old Worshipful Company of Musicians in UK for his contribution in artistry to the Royal College of Music when he was a student there. Born in Shanghai where Chen studied with Peter Shixiang Zhang, Jiyang Zhao and Lei Fang. He attended the Primary and Middle Schools Affiliated to Shanghai Conservatory of Music and the Chetham’s School of Music in UK and holds a Bachelor of Music (Hons) Degree from the Royal College of Music in London where he studied with Jan Repko and a Master of Music Degree from The Juilliard School in New York City where he studied with Cho-Liang Lin and Ronald Copes. He has also worked with Pierre Amoyal, Ana Chumachenko, Bernard Greenhouse, Boris Kurshnir, Itzhak Perlman, Vadim Repin and Ruggiero Ricci. Chen’s artistry has also supported humanitarian causes, including the “East meets West” event organized by the British Red Cross. In 2008, he organized seven recitals in the UK and Italy where raised over £4800 ($7800USD) to give scholarships to students from Sichuan studying in Shanghai after the 2008 earthquake in Sichuan, China. He has also donated his services for fundraisers on behalf of English National Opera, Dance Umbrella International Festival and Royal College of Music Annual Fundraising events. Chen teaches at the Chetham’s School of Music, Royal College of Music and the Birmingham Conservatoire. He is the music director of the Jiafeng Chen Music Studio which holds music summer courses in world’s leading cities since 2015. He plays a Nicolo Gagliano violin (Naples, 1751) kindly on loan from a generous group of owners.